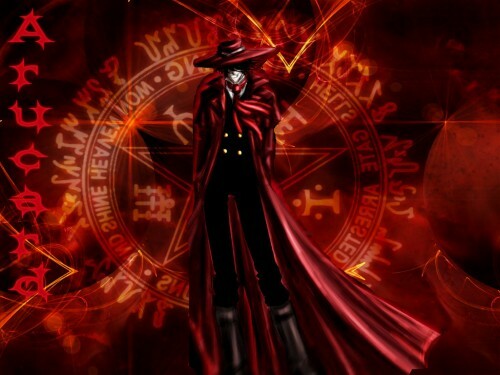 Nice picture of Alucard, it's nice as a wallpaper in general but in my opinion, the text seems out of place where it is.. and why'd you mirror the pentagram from his glove? I would have preferred it if it was left alone. the wall's nice but it would have been much better off whitout that writing. my opinion anyway. Hey, that's a nice Alucard/Arucard/whatever wallpaper. Thanks for sharing! good background, nice use of foreground shading as well. Yes, cool wallpaper. Awesome, really! Fantastic scan, intense and detailed bg, and a nice integration between the two. The text on the left side though...doesn't fit in the slightest. Not only is it competing for attention with the text on the pentagram, but it's not his name. Still a very nice wp though. Great background. large workstations. all this in a tone "bloody"